Full titled History of a Six Weeks' Tour through a part of France, Switzerland, Germany, and Holland; with Letters Descriptive of a Sail Round the Lake of Geneva and of the Glaciers of Chamouni, this small journal was a travel narrative kept by the English Romantic authors Mary Shelley and Percy Bysshe Shelley. They describe two trips, both taken by Mary, Percy, and Mary's stepsister, Claire Clairmont: one across Europe in 1814, and one to Lake Geneva in 1816. Divided into three sections, the text consists of a journal, four letters, and Percy Shelley's poem "Mont Blanc". 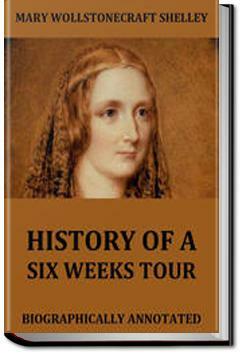 Apart from the poem, the text was primarily written and organized by Mary Shelley. Anti-climatic compared to Mary Wollstonecraft's Letters abroad. This is essential reading for anyone who wants to know what it would have been like to travel France and Switzerland just after the Napoleanic Wars ended. And what could be more amusing than reading a description of Shelley knocking down another boat passenger who was being rude? "Nature was the poet, whose harmony held our spirits more breathless than that of the divinest." Brief, curious, very descriptive, beautifully written.